High-tech Agriculture, or Agriculture 4.0, has become a buzzword in recent years. The advancement of science and technology has forced many traditional activities to change and adapt to meet the needs of the market. The shrimp industry is also taking the necessary breakthrough steps, with a wide range of outstanding technology being applied and super-intensive shrimp farming being developed by the Viet Uc Seafood Corporation (Viet Uc), allowing it to expand on a large scale. Founded in 2001, after some 17 years in Vietnam’s aquaculture sector Viet Uc is the now leading shrimp seed agency in the country. With a desire to “Transform Vietnam’s Shrimp”, Viet Uc continuously improves quality by investing in technology and people. Its market share in Vietnam’s seed market stands at more than 25 per cent. The most important factor determining quality is the source of the brood stock. Viet Uc has partnered with leading agencies from around the world for more than five years to implement a breeding program and is an active source of brood stock, with a growth rate of 48 per cent from G0 to G7 (Generation of Brood stock). In order to bring superior shrimp seed from this brood stock to farmers. Viet Uc has boldly implemented a system of hatcheries, from the north of the country to the south, to minimize the distance from hatchery to farm. 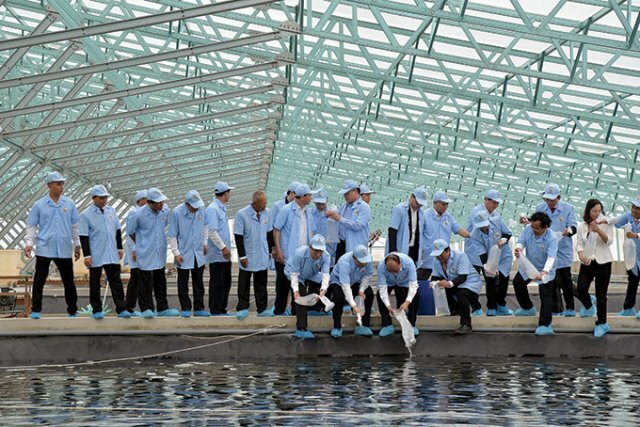 It currently has nine large-scale hatcheries, in Quang Ninh, Nghe An, Binh Dinh, Binh Thuan, Ninh Thuan, Ben Tre, Bac Lieu, Soc Trang and Ca Mau provinces, with a total capacity of over 50 billion postlarvae per year and employees numbering over 1,700. Investment in the human factor is also crucial in ensuring the quality of the brood stock. Viet Uc has cooperated with many major strategic partners around the world, such as the CSIRO (Australia’s leading seafood research institute) and MBD, as well as national partners such as Can Tho University, Nha Trang University, Nong Lam University, and the Aquaculture Institute II to build a professional team for the purpose of implementing the best solutions for each segment of the industry (brood stock, shrimp seed, feed, super-intensive greenhouse shrimp farming, and processing plants). Within these, greenhouse shrimp farming has been given particular focus. With the first super-intensive greenhouse shrimp farming model in Vietnam, successfully implemented on 50 ha in Bac Lieu province, Viet Uc continues to build high-quality shrimp production complexes in Bac Lieu (315 ha), Binh Dinh (300 ha), and Quang Ninh (300 ha), which provide the market with “Perfect Shrimp” in terms of quality and output. The high-quality shrimp complexes also help to enhance the value and sustainable development of Vietnam’s shrimp industry. To achieve export turnover of $10 billion prior to 2025 under the direction of Prime Minister Nguyen Xuan Phuc, Vietnam’s shrimp industry has many opportunities to seize but also many challenges to overcome. With support from the Ministry of Agriculture and Rural Development and leaders of agencies and organizations, Viet Uc actively cooperates to share its experience and transfer technology with shrimp farmers throughout the country and strategic partners, experts, and scientists. Together they take the brand name of Vietnamese shrimp to the world.